You can think of a capacitor somewhat like a rechargeable battery. It is able to store energy temporarily except that a rechargeable battery will last much, much longer than a capacitor. 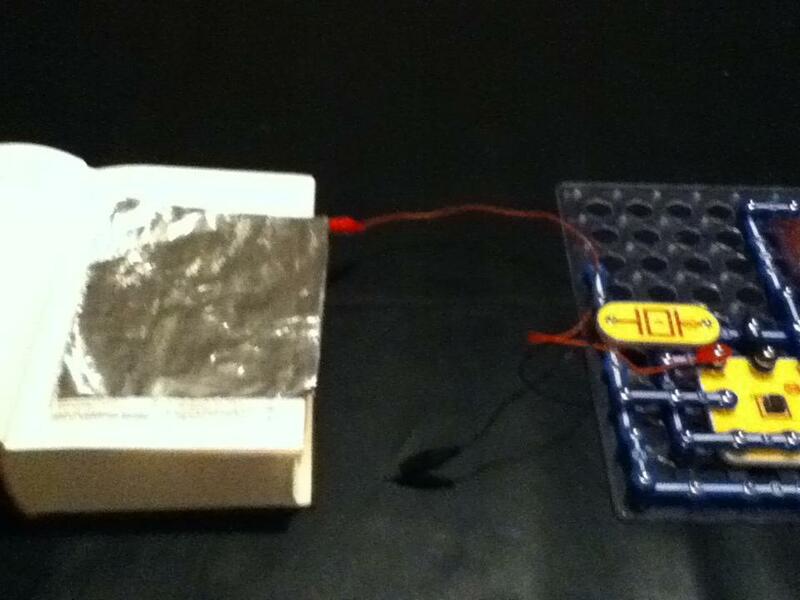 The simplest capacitor is two conducting plates with a non-conducting material such as paper sandwiched between them. 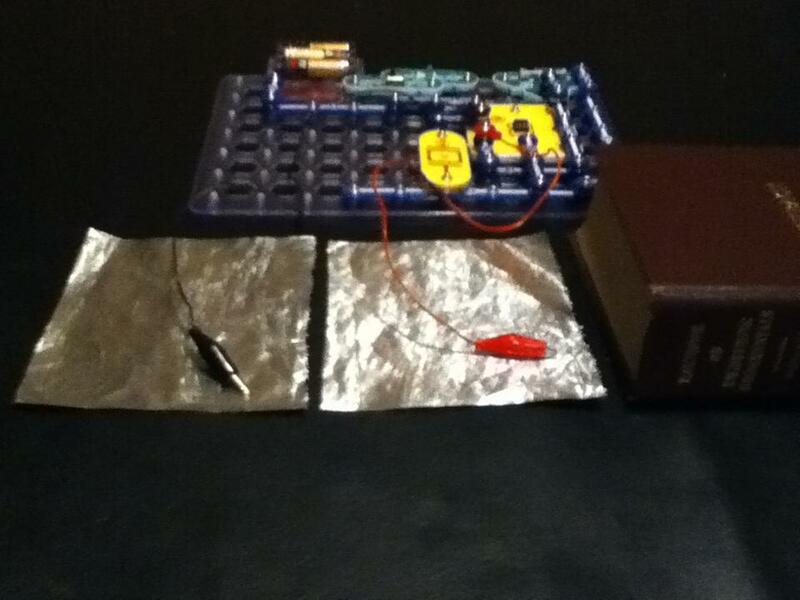 You can make your own capacitor using aluminum foil and a book. I connected the alligator clips with the tin foil sticking out the front of the book for the photograph, but you can (and I recommend this) connect the alligator clips with one piece of foil sticking out of the right side of the book and one piece of foil sticking out of the left side of the book. This will reduce the chance of the foil plates touching and shorting the circuit. You can also slide one or both of the foil plates in and out of the book to see how the tone changes. In the video following, when I first switch the circuit on, you’ll hear a high pitched squeal, but as I press more and more firmly on the cover of the book, the tone gets lower and lower. What’s happening is, as I press on the book cover the plates are pressed closer together and this increases the capacitance. As capacitance increases in this circuit, the frequency and thus the tone decreases. As I press less firmly, the plates move farther apart. This causes the capacitance to decrease and the tone (and frequency) to increase. 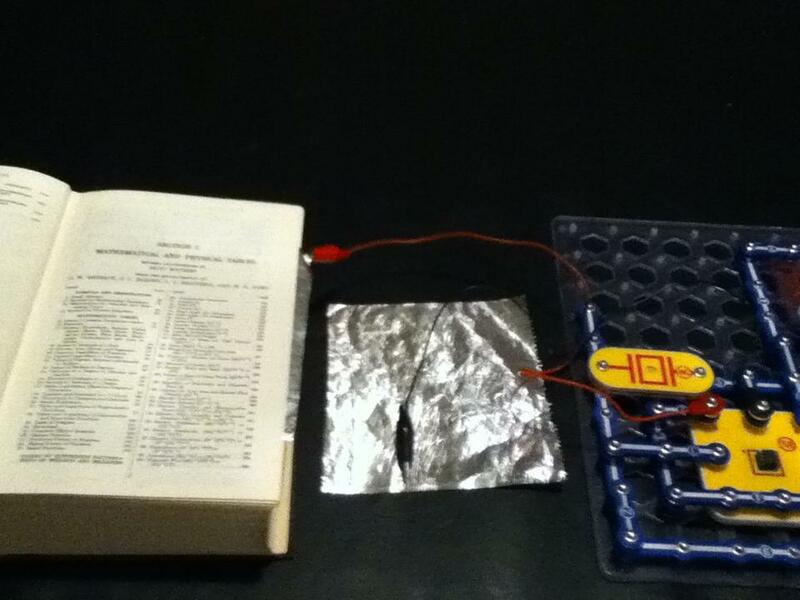 The book capacitor (1) is two conducting plates, that is, the aluminum foil, and an insulator (the book page) sandwiched between them. 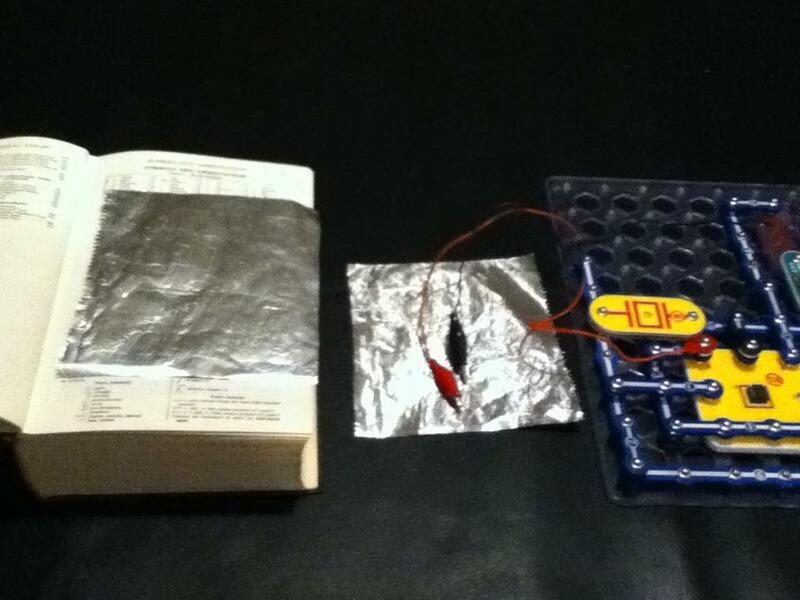 If you were to connect your book capacitor to the 4.5 volt battery block, electrons will be drawn away from one of the sheets of aluminum foil and will collect together on the other sheet. The plate with the excess of electrons has a negative charge. The plate from which the electrons were drawn away has a positive charge. The capacitor is now charged up. If you disconnect the capacitor from the battery block, it will continue to hold this charge and the capacitor acts like a battery storing energy. If we connect the capacitor to a light emitting diode (LED) the capacitor can now discharge and the energy from the discharging capacitor can be used to do useful work such as light up an LED (if only temporarily, that is, until the capacitor is completely discharged). A capacitor is like a rubber membrane sealed inside a pipe. Water molecules cannot pass through the membrane, but some water can move by stretching the membrane. • The current alters the charge on a capacitor, just as the flow of water changes the position of the membrane. More specifically, the effect of an electric current is to increase the charge of one plate of the capacitor, and decrease the charge of the other plate by an equal amount. This is just like how, when water flow moves the rubber membrane, it increases the amount of water on one side of the membrane, and decreases the amount of water on the other side. • The more a capacitor is charged, the larger its voltage drop; i.e., the more it "pushes back" against the charging current. This is analogous to the fact that the more a membrane is stretched, the more it pushes back on the water. 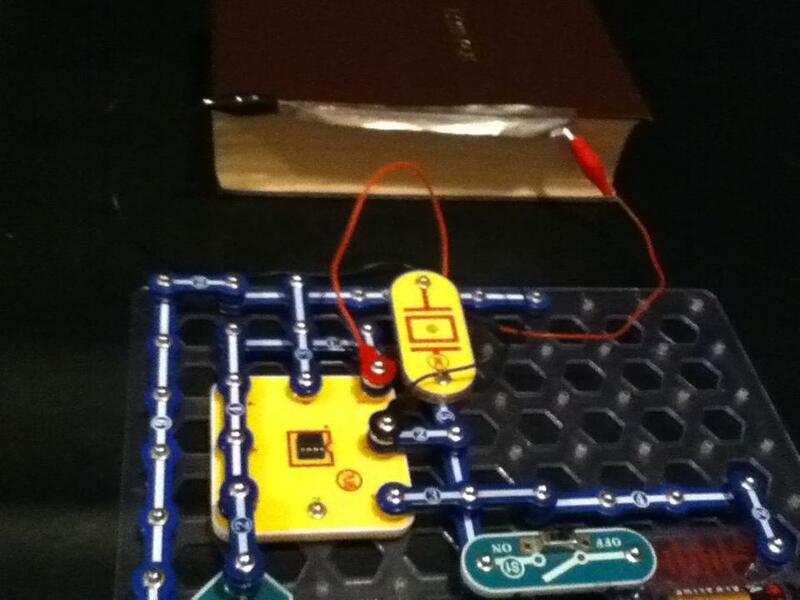 • Charge can flow "through" a capacitor even though no individual electron can get from one side to the other. This is analogous to the fact that water can flow through the pipe even though no water molecule can pass through the rubber membrane. Of course, the flow cannot continue the same direction forever; the capacitor will experience dielectric breakdown, and analogously the membrane will eventually break. • The capacitance describes how much charge can be stored on one plate of a capacitor for a given "push" (voltage drop). A very stretchy, flexible membrane corresponds to a higher capacitance than a stiff membrane. • A charged-up capacitor is storing potential energy, analogously to a stretched membrane.